Please pack efficiently, as space on board is limited. Each person is allowed to carry on board a maximum of 3 bundles: (1) sleeping bag/bed roll with small pillow, (2) soft-sided collapsible bag for clothing and gear, and (3) bag of food. Coolers may be used to transport cold items to the boat and into the boat's icebox, however the empty coolers must then be returned to your car. Wear boat shoes or non-marking shoes. Sneakers with white soles also work well and do not mark the deck. Flip flops are not recommended. Light to medium weight waterproof jacket (and pants if you have them). Be prepared to shed or add two layers of clothing. It is generally cooler on the water, so bring clothes that are slightly warm for the season, then shed layers if needed. Even rainy days during summer can feel damp and cool. Suggestions: Under Armour, turtlenecks, sweaters or sweatshirts, light jackets, fleece pullovers, bathing suits. Bring an extra full change of clothes in case you get wet, including shoes. Bring casual dinner clothes if you plan to have dinner at a restaurant onshore. Bring two snug-fitting and shade-producing hats or visors. (Keep in mind you could lose it overboard, so don’t bring anything irreplaceable.) A cord to clip your hat to your shirt is a good idea. Camera, toiletries, towel/wash cloth, sleeping bag/bedroll, sheet (in case it is hot), pillow, ear plugs. (Note: there will be onshore shower and toilet facilities.) You may want to bring a flashlight and sailing gloves. The cruise fee does not include slip fees. Slip fees differ for each trip, and are thus calculated upon arrival at the destination. Bring at least $30 cash in small bills to pay your share of the slip fee. Also, you are responsible for your own onshore costs, such as coffee shop and restaurant expenses. Bring your own food for breakfasts, lunches, snacks, and drinks. Water is a must. It has been a tradition to bring wine or beer. Some very ambitious sailors have been known to conjure up special drinks, so feel free - however, bring your own ice, blenders, mixers, and tools. It is a tradition to bring wine, beer, and/or hor d'oeuvres to share during the after-arrival happy hour. This usually takes place on one of the boats, at the pool, or at a nearby beach. As mentioned, bring two hats or visors (one for backup). Also, bring sunglasses (and retention cord), sun block, chap stick, aloe/lotion, and anything else you would need when spending time in the sun and elements. Keep in mind that when you are on the water, the reflection of the sun off the water intensifies the amount of solar radiation you receive. If you start to feel queasy while underway, notify the crew and stare at a fixed object a mile or two away while taking deep breaths. You may also experience dizziness after the trip, which can be dangerous while walking along the dock or standing in the shower. Relax and give your body time to readjust to land. Dehydration can hit you sooner that you expect. You will not have a problem if you just keep drinking water throughout the day. Drink regularly and do not wait until you feel thirsty. Beer is not a substitute for water. In fact, beer will dehydrates. Some soda is okay to drink, but for hydration water or sports beverages are best. Cruising is a team effort. Everyone must contribute. Try to help in some way – food organizing and prep, cleanup, anchoring, etc. If you are going down below to get something to drink, ask if anyone else needs one. Everyone needs to help cleanup at the end of the trip. Sailors must return the boat to the condition they find it. This means a full galley cleanup and wipe down, head cleanup, topside scrub down (particularly around the anchor area), garbage disposal, and returning all boat items to the proper place. Cleanup can go rather quickly if everyone helps. Note: The head (aka toilet) on board is not constructed to handle anything that has not passed through your body first. The only exception is toilet paper and try not to overdo that either. It is always preferred to wait until we reach the destination. We have limited space. The LV and TB each have six berths - specifically, two doubles berths and two single berths. You may be asked to share a double with another crew member. Depending on the weather, some crew prefer to sleep on deck or in the cockpit under the stars. (Great for snorers.) The crew decides sleeping arrangements upon arrival. Please be considerate of surrounding boaters. Keep the noise down after dark. Water is an excellent carrier of voice. 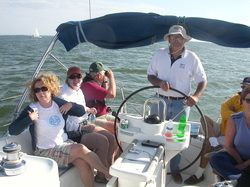 Boaters on neighboring boats can easily hear your intimate conversations, whether they want to or not. DO NOT JUMP! Hold onto the lifelines or shrouds while stepping one foot onto the dock, then the other. If you are not able to step off to the dock, then the boat is too far away. Wait until the boat drifts closer to the dock, or gently pull one of the lines to guide the boat closer. When in doubt, ask for help. At all times, keep at least one hand onto a lifeline or shroud for balance. Wear shoes when you are going to perform a task or the seas are rough. Wear a personal floatation device (PFD) if working on deck in rough seas. Always move slowly and deliberately. We are cruising and not racing, so take your time. Pets are not allowed on club cruises without prior approval from the Commodore, captain, and all crew. Even dogs that are strong swimmers such as labs cannot swim against the strong bay currents after falling overboard. Tall waves can be enough to drown an animal. Should a pet fall in the water, maneuverability of sailboats while under sail is limited, and thus it can take several minutes to transition from sailing to motoring. During this time, the crew can lose sight of an overboard pet, and the pet can be lost. Pets on board ships should not be taken lightly.